National Geographic photographer Gordon Wiltsie at work juggling his camera in the cold while trying to catch the attention of Cola and Paul. "I'd forgotten how difficult dog sledding photography is" Gordon stated Thursday while his Nikon 8008 camera froze up in the chilling wind!!! Now this is coming from Gordon Wiltsie, a National Geographic photographer who is world renowned for his abilities to capture incredible images in even the most difficult conditions. 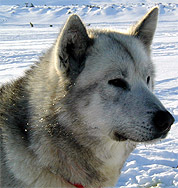 Gordon has dog sledded with us since we left Gjoa Haven last weekend trying to photograph and capture our journey. Very few photographers are able to just step in and participate in a dogsled expedition, but that's no problem for Gordon. He is a veteran and has traveled around the world with his camera on many wild adventures. Over the years, he has also traveled with the Polar Huskies many times. "Dog sledding photography is such a challenge because you are working in the most extreme cold weather conditions making everything much harder and the equipment difficult to work with. Add the challenge of just mushing the 20 dogs, getting the exact right light, and capturing the moment. I think only alpine mountaineering would be more challenging.” Gordon is basically traveling along as a team member. He has his own tent, but we all eat together in our tent. During the day, he skis along with one of the sleds (just like we do) and Gordon is really good with the dogs. His favorite is Nuka The weather this week has not made it a whole lot easier for Gordon to do his job either. We had a little bit of everything. Sunday when we left from Gjoa Haven was absolutely gorgeous, but Monday we were hit by another storm leaving us in near white out conditions, though luckily, it wasn't too cold. That was followed by some really weird days that would start out crisp and clear with icy winds, but would end in warmer conditions with cloudy flat light and sometimes even snow. Thursday, we had a real “freezer” day with blue sky and sparkling sun but a cooold wind that instantly chilled us. Late Friday night, as we pulled into Taloyoak the weather was beautiful, that is, until the fog rolled in later that night. Being Gordon's favorite Polar Husky, Nuka earns the Polar Husky star. "She is my favorite because she is so friendly, very happy and eager to go jumping up in the air to start the sled" says Gordon. Nuka runs on Mille's team most often as a team dog or in point. Though lately, she has also been running with Aksel in lead when Mille's team is following. 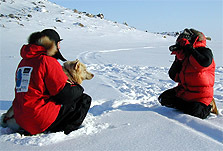 Having learned a lot and getting better every day, Nuka also earns the Polar Husky star because she is the dog that has improved the most on this expedition. Do you remember how we use to have pretty constant weather for a couple of days in a row earlier in the trip? Well, that has changed now that Spring is coming. The sun is definitely gaining power. It is starting to make a difference during the day and it feels much warmer in the sun. The surface of the snow becomes softer as well. Friday was the first day we really noticed the softer snow as the dogs were constantly getting snowballs in their feat. To avoid this problem in the future, we are going to trim the hair and nails of their paws. For us, it just means a little more of a challenge trying to dress properly. During the day it is easy to over heat, but then setting up camp at night we easily get cold when the temperature start dropping. The fact that the sun appears high or low on the sky is actually what controls the Arctic climate! You might remember earlier that we described how the tilt of the earth makes arctic polar region point towards the sun in summer time creating 24 hour daylight up here for a couple of months. Away from the sun in the winter time, the Antarctic regions is covered with 24 darkness for a couple of months. It would be pretty easy to think that this is what causes extreme cold in the Arctic. Actually, it is not the amount of time that the sun is above horizon which controls the arctic climate. Realize that the sun is up the same amount everywhere on earth, exactly one half of the year! Instead, it is the sun's failure to rise very high in the sky at any time of the year in the arctic that is the cause of the cold (which IS caused by the tilt of the earth). At high latitudes, the sun's rays always strike the ground at a greater angle; therefore, a given amount of solar energy is spread more "thinly" (over a larger patch of ground) than it would be in the lower latitudes where the sun rises higher in the sky. Moreover, the rays from the a low sun have passed through a greater thickness of atmosphere than have those form a high sun and loose much of their energy by absorption before ever reaching the ground. The two bright spots or bars on each side of the sun that you can see on this picture are called "sun dogs". Technically it is referred to a the sun's perihelia and is caused by the refraction of light through airborne ice crystals. The height of the sun is not the only control, however, the cold is tempered by warmth reaching the Arctic from the south. This warmth comes in the form of warm air masses and warm ocean currents (the gulf stream). Now this "warming," comes more from the moisture that they contain than the actual heat inside the air masses (which is often high above the ground). This moisture condenses into clouds and the clouds causes what is called a "blanketing effect.” Clouds trap the heat making a cloudy night milder than a clear one! (Try and check out whether this is also the case where you live!) The movements of warm air masses have the effect of evening out the temperature extremes. Without them, the arctic would be colder and the tropics would be warmer. During the long night of the arctic winter when the sun never rises, no solar energy reaches the ground at all. If it were not for the arrival of air masses from the south, the temperature would drop to unimaginably low levels. But with these southern air masses moving, the temperature drops up and down, though not on a 24 hour basis as there is no night and day. This explains why we would see days and nights of the same weather and temperature in the beginning of the trip. When it was 40 below, it stayed like that day and night! Whereas more recently, the sun is up 18 hours a day and the temperature does vary on a 24 hour basis. Even during the “midnight sun” period (where the sun never sets,) the sun is higher when it is to the south (mid day) than when it is to the north (mid night) and temperature rises and falls correspondingly. Since we are always talking about all this dog sledding, igloos, and cold weather, its difficult to imagine warm weather; however, in midsummer you can have a nice balmy day with 70 degree Fahrenheit weather (low 20's Celsius) up here. Climatologists define the Arctic as the region with an average temperature of no more than 10 degrees Celsius for the warmest month of the year. Arctic regions are also described by the number of months where the average daily temperature never rises above freezing and increases as latitude increases. By this definition, the southern boundary of the Arctic is also at the northern most region that trees can grow, the treeline. Biologists use the treeline itself to define the southern boundary of the Arctic. Another characteristic of the Arctic is permafrost. Which is permanently frozen ground underneath most of the surface. This surface soil freezes and thaws each year. The amount of thaw varies from a few inches to the several feet. As a result, water has no real drainage path. The soil is low in nutrients, especially nitrogen and only the toughest plant are able to survive! Paul eating lunch on another day of blowing snow! Taloyoak is the northern most community on the Canadian mainland. The word Taloyoak (pronounced ta-low-ruaq) is a misspelling of the Inuktitut word talurjuaq, meaning "large blind" which refers to a large stone caribou blind on the outside of town which was traditionally used by the Inuit of the area to corral and harvest caribou. The caribou come through here (the ones we met south of Gjoa Haven) at the end of May and people are still pretty excited about their coming arrival. However, the Inuit of this region relied mostly on seals as their traditional main source of food and clothing. We are very honored to be invited as guests to watch the art of seal hunting with some elders in the next couple of days (if the weather behaves). We are also going to spend some time at the local school. Yesterday when we arrived it was Cultural Day, meaning the whole school traveled out on the land to fish, build igloos, and learn traditional skills. It was made even more exciting because the students here were joined by a group of exchange students visiting from British Columbia in western Canada for a week!! They have a ton of cool activities planned for the coming days and we are hoping to take part in a couple of them. We are also busy picking up resupplies, repacking the sleds, and of course, looking at the route ahead with the local elders. More on all of that next week!